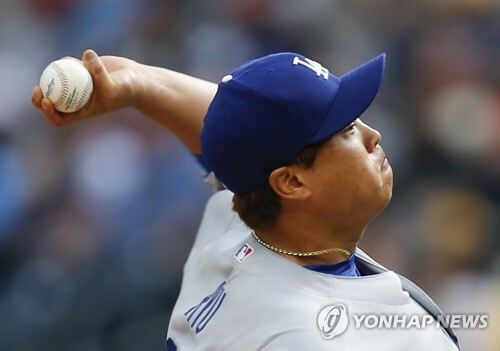 SEOUL, Aug. 25 (Yonhap) — Ryu Hyun-jin of the Los Angeles Dodgers has earned his fifth win of 2017 against the Pittsburgh Pirates. Ryu improved to 5-6 after allowing just one run across six innings in the Dodgers’ 5-2 victory at PNC Park in Pittsburgh on Thursday (local time). He was lifted for pinch hitter Austin Barnes in the top seventh when the Dodgers were leading 3-1. It was Ryu’s first victory since Aug. 6 when he pitched against the New York Mets. He had no-decisions in his last two outings. Against the Mets, Ryu struck out two while giving up four hits and two walks. He threw 93 pitches, 55 for strikes and lowered his ERA from 3.45 to 3.34. The left-hander has been strong since the All-Star break, going 2-0 with a 1.54 ERA in six games. Ryu, who joined Major League Baseball (MLB) in 2013, now has a career record of 4-0 with a 2.49 ERA against the Pirates. In his 19th start of the season, Ryu gave up his only run in the bottom second after two outs. After walking Sean Rodriguez, Ryu gave up a single to Elias Diaz and surrendered another to Jordy Mercer to allow the Pirates level the score 1-1. He, however, escaped the jam by inducing Chad Kuhl into a grounder to first base. In the bottom third, Ryu gave up his second walk of the game to Andrew McCutchen, but this time, he had no trouble wrapping up the inning, thanks to third baseman Justin Turner who made a nice diving stop on a ground ball from Josh Bell. The Dodgers in the fourth handed Ryu a 2-1 lead with Curtis Granderson’s solo shot. The 30-year-old South Korean then wrapped up the fourth and fifth innings in just 18 pitches. In the sixth, he gave up a single to David Freese after two outs, but struck out Rodriguez to end the inning. Ryu also did his job well at the plate. In the top second, he successfully laid down a sacrifice bunt to move Enrique Hernandez, who was on first after a walk, to second. Hernandez later scored following Chris Taylor’s single to center field. In the sixth, Ryu got a single against Pirates reliever Steven Brault, which was his fourth hit of the season. Following Ryu’s hit, the Dodgers made a bases-loaded opportunity with a double and a walk, but they failed to convert the chance. The Dodgers, however, went 3-1 in the seventh with Yasiel Puig’s double followed by Hernandez’s single. The Pirates cut the deficit to one right away with Adam Frazier’s line drive against the Dodgers reliever Tony Watson, but Yasmani Grandal and Adrian Gonzalez hit back-to-back home runs in the eighth inning to seal their 90th win of the season. With the latest victory, the Dodgers now have five consecutive seasons of 90 or more wins. They also became the 12th team in major league history to reach the 90-win mark in 126 games.